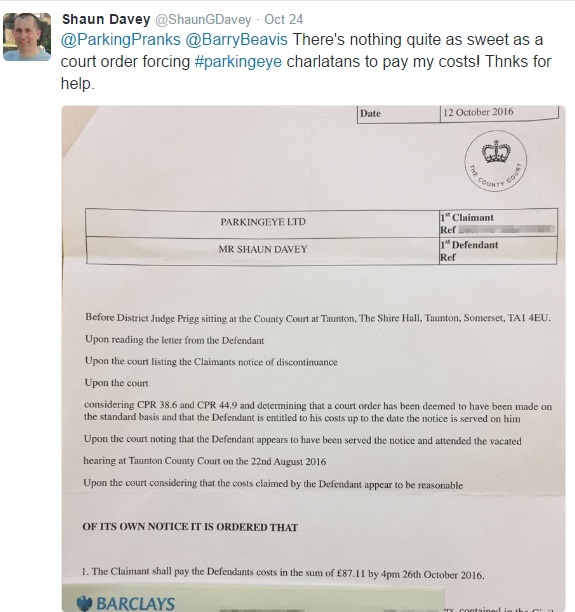 ParkingEye decided to take Mr Davey to court...then at the last minute decided not to. The Prankster has no idea whether this was due to the sterling qualities of Mr Davey's defence, or whether ParkingEye could not find any lawyers willing to hike it over to Taunton. In any case, ParkingEye did not bother to tell Mr Davey, so he turned up in court anyway, only to find the hearing had been discontinued. This is a common trick of ParkingeEye, and The Prankster has also been on the receiving end of this. Mr Davey therefore prepared a schedule of costs which he sent to the court, along with a covering letter. 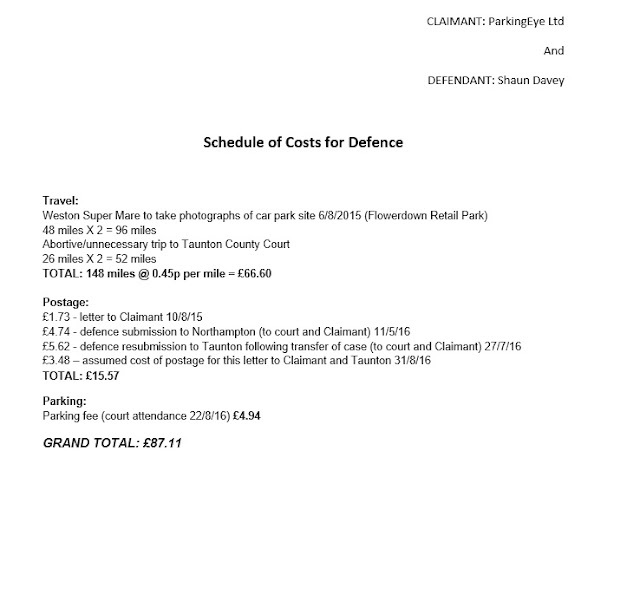 This seems to have done the trick as DJ Prigg ordered ParkingEye to pay the £87.11, as the reasonable costs which were incurred by the defendant. Pity he hadn't costed his time for dealing with this @ £19 per hour. Time off work too? PE have got off lightly. What does "LIP rate" mean? What's the limit on hours we innocents can claim for? I've spent weeks/months of hours on researching this nonsense. "ParkingEye charged costs for discontinuing"
Ah! Every cloud has a silver lining! That there is great battle won. Well done Mr Davey!